Credit: CNES. Download this image (JPG, 209 KB). 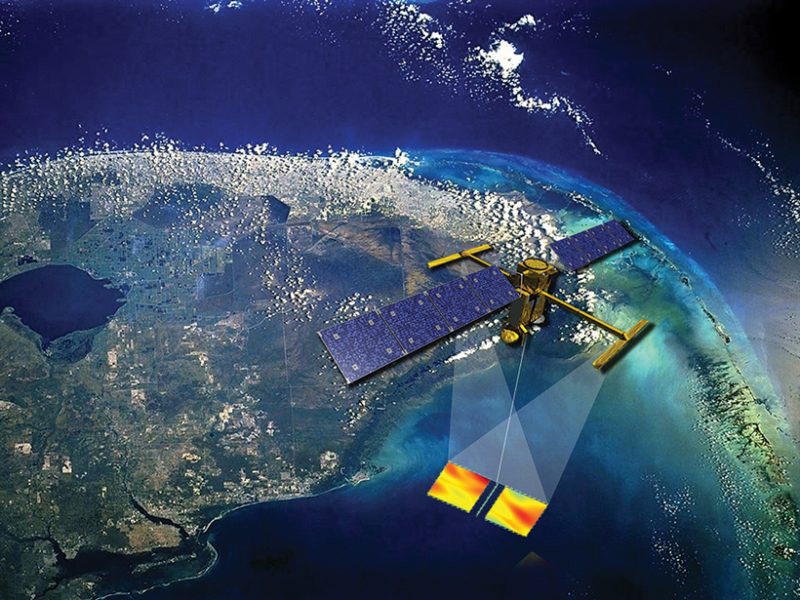 [02-Jan-19] Artist's impression of the future SWOT satellite making sea surface height observations, even through clouds. SWOT will rely on a satellite altimeter that will use radar interferometry to make high-resolution (~1-km) measurements over two 60-km-wide swaths of water at once, with a conventional nadir altimeter in the gap in between. This new SWOT measurement will extend the two-dimensional resolution of ocean surface topography down to between 15 and 45 km in wavelength, detecting small eddies with diameters of 7 to 20 km, depending on ocean surface conditions. This advance will offer researchers new opportunities to study the oceanic dynamic processes at these scales over the global oceans.